Marsalis’ ability to transform the meaning of this tune through his speech and his playing (which I discuss below) reminded me of another masterful reinterpretation given to another well-worn sixteen-bar melody in a different genre: Paul Simon’s use of the hymn ‘O Sacred Head, Now Wounded’ in his Watergate-era song ‘American Tune’. The narrator in the text of the hymn, well known for its use in J.S. Bach’s St. Matthew Passion, speaks of identifying his own struggle for salvation with the biblical story of Jesus’ suffering; in some Christian traditions it is sung just before the story of his resurrection is celebrated at Easter. 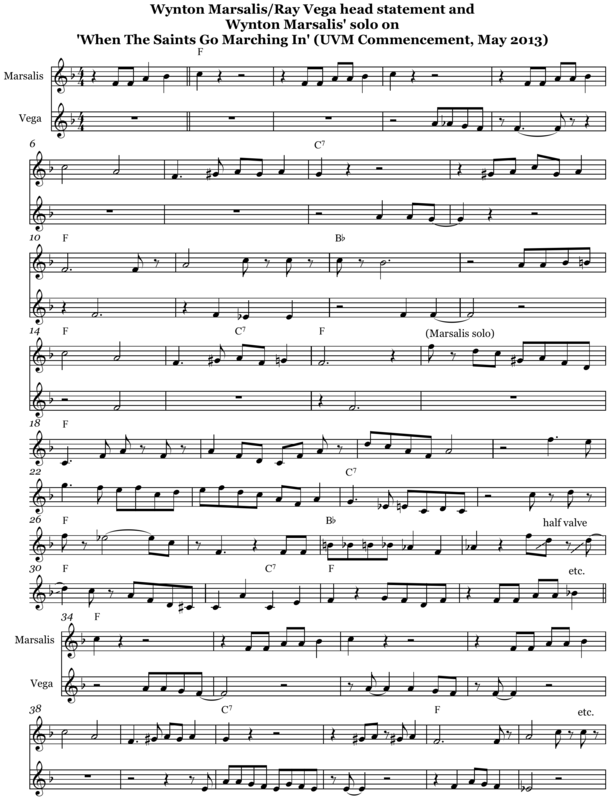 Simon uses the hymn’s melody as the basis of a song which had particular significance in the era following the Vietnam War and the Watergate scandal. Simon’s narrator speaks having been ‘forsaken’ and ‘misused’, but moves from this awareness of personal loss toward a sense of empathy with others in a similar situation, saying ‘I don’t know a dream that’s not been shattered / don’t have a friend that feels at ease’. Marsalis made a shift in meaning similar to the one Simon made in ‘American Tune’ by taking ‘When The Saints’, a song with lyrics based on the book of Revelations and its images of the end of the world and which which has often been used to commemorate the end of an earthly life, and turning it into a statement of profound hope for a group of young people embarking on their careers. In doing so, he demonstrated, like Simon (who performed ‘American Tune’ at a concert celebrating Jimmy Carter’s inauguration), a crucial service to the public sphere that a master musician can provide: the ability to take a song which seems to have been given every interpretation possible and find yet another level on which it can resonate. Marsalis’ solo in his UVM version of ‘When The Saints’, accompanied by Ricky Gordon on percussion and framed by head statements with Ray Vega on a second trumpet part, could be described as a short history of jazz improvisation. He begins (at m. 17) in the style of early jazz (staying close to the scale the song is built on – F major – and the triadic harmony of its opening measures), moves into a more blues-based approach (introducing a flatted seventh [E flat], outlining the F 7th chord, introducing what could be called the ‘F minor blues scale’, and including one of the quasi-vocal gestures that Marsalis is so adept at coaxing out of the trumpet) and closes with what I’d call a nod to the bebop language (by using what Barry Harris calls ‘the half step between the fifth and the sixth’). Ray Vega’s answers to Marsalis’ melody phrases during the head in and out provide a real counterpoint to the melody; he finds a number of different ways to counter the ascending motion of the opening phrases with downward motion, and then switches to filling in the harmony in the later phrases of the tune. When Marsalis repeats the melody after his solo, Vega’s responses become more frequent and spirited, which is perhaps what causes Marsalis to alter the melody at m. 41; before that point his repeat of the melody is quite similar to his opening statement. To me, it is another mark of the master musician that Marsalis responds to Vega by finding a way to play one less note in this phrase than he did previously. To my ear this demonstrates how, especially on a small scale, leaving space can be an answer as meaningful (and as respectful) as an audible response. The power of Marsalis/Vega performance sent me on a voyage of rediscovering this tune that I have taught many times through the arrangement that appears in the Alfred Adult Basic Piano Method Volume One. First, I went to YouTube and checked out a variety of versions of the tune. Some were truly swinging, including the 1938 big band version by Louis Armstrong that began the popular fascination with the song, a 1963 version by one of Armstrong’s small groups that shows his remarkable ability to adapt to changing styles of jazz and multiple generations of players, a live version by the Preservation Hall Jazz Band, and a cool reharmonization by Dr. John. Some were surreal, like the 1960s version led by Dinah Shore on her TV show, featuring Al Hirt, Andy Williams, Ella Fitzgerald, and Perez Prado and his orchestra. All these versions use a call and response structure in some way or other. In doing so, they provide a link to African-American gospel music, the crucible that, through its heat and ingenuity, transformed ‘When The Saints’ and many other folk songs into sources of glorified light in American popular culture. Listening to these versions helped me understand what is so special about the Marsalis/Vega version: it makes it easy to hear the musical conversation, the calls and responses, through which improvisors collaboratively transform a melody: the lead part creating its variations on the original melody while being influenced by the echoes or counterlines which the second part plays in the breaks. Both the ’63 Armstrong version and the Preservation Hall version follow a typical New Orleans front line approach in which the trombone and clarinet improvise simultaneously in response to the calls of the trumpet as it plays the melody. The result is a joyously busy contrapuntal texture, but if one can isolate the interplay of Armstrong and trombonist Trummy Young in the ’63 video, one can hear the conversational tradition that Marsalis and Vega draw from in their duet. In this tradition, all voices are free to participate in the statement of a theme by adding their own variations and even to occasionally overlap the lead voice. In the Marsalis/Vega duet, however, Ray Vega skillfully demonstrates an important guideline for the melodic conversation: in order to overlap meaningfully with one’s duet partner, one must first know how to stay out of their way. Other versions of ‘When The Saints’ are forgettable and yet indicate the wide ranging impact of the tune, like the version by the Beatles in an early incarnation when they were fronted by an Elvis Presley-influenced singer named Tony Sheridan. Although this version neuters the song by removing swing feel and call-and-response structure, it demonstrates the Beatles’ gift for mimicry, as it seems they and Sheridan imagined what a version by Elvis would sound like at a time when none was available. (YouTube suggests that Elvis didn’t record the tune until a 1965 version in the film Frankie and Johnny, a few years after the Beatles became a success in the U.S.A. Although Elvis’ version has more swing feel than the Beatles’ version, it neuters the song in other ways, combining it in a medley with ‘Down By The Riverside’ sung by an all-white chorus and marching band.) The Beatles’ version also provides a link to a later and more evolved phase of their creativity: in their original tune ‘I Saw Her Standing There’, they borrow the chord progression from ‘When The Saints‘ but disguise the borrowed material through adding new harmonic twists and a bridge of unusual length for a pop song. 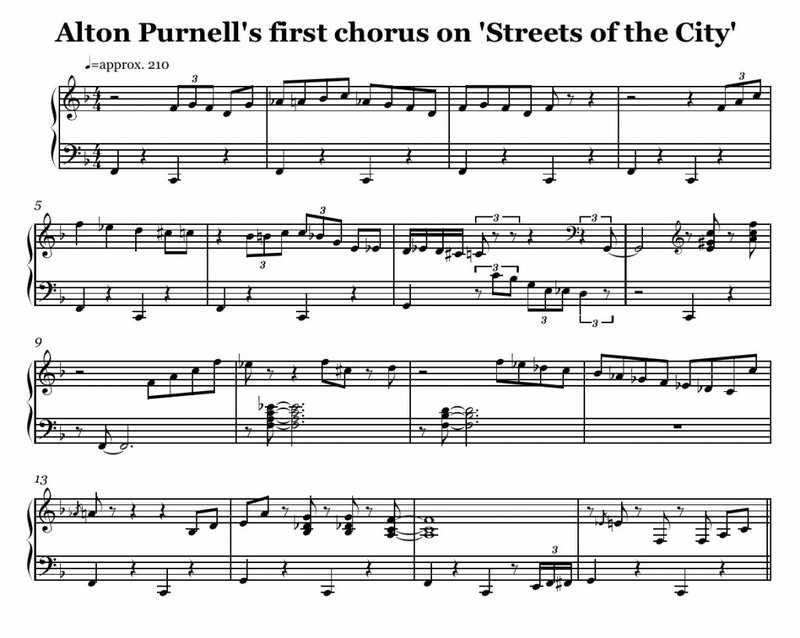 I also looked up ‘Streets Of The City’, a tune by New Orleans composer Paul Barbarin which uses the same chord changes as ‘When The Saints‘. (While Barbarin’s tune is a jazz variation on the tune, the same changes are shared by tunes in other tradtions, including ‘She’ll Be Comin’ Around The Mountain’, Willie Dixon’s ‘My Babe’ and its gospel forebear, Sister Rosetta Tharpe’s ‘This Train’.) A version of ‘Streets‘ by clarinetist George Lewis (available on iTunes) includes a great solo by pianist Alton Purnell which demonstrates how the call-and-response concept can be applied on the piano. Purnell’s left hand spends most of the chorus doubling the bassline in the low register of the piano, but in the middle of the chorus Purnell includes some more block-chord style comping through which his left hand responds to his right much as Vega responds to Marsalis in m. 10-17 of ‘When The Saints’. 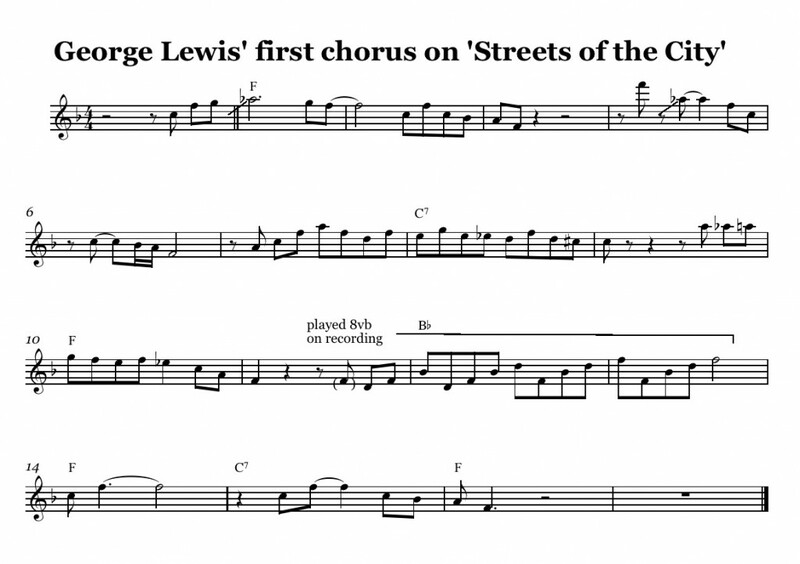 The first chorus of George Lewis’ clarinet solo, like Marsalis’ solo at UVM, is a model of how to combine diatonic playing (which in the case of this tune means limiting oneself to the F major scale) with judicious chromaticism that helps the improvised line ‘make the changes’. 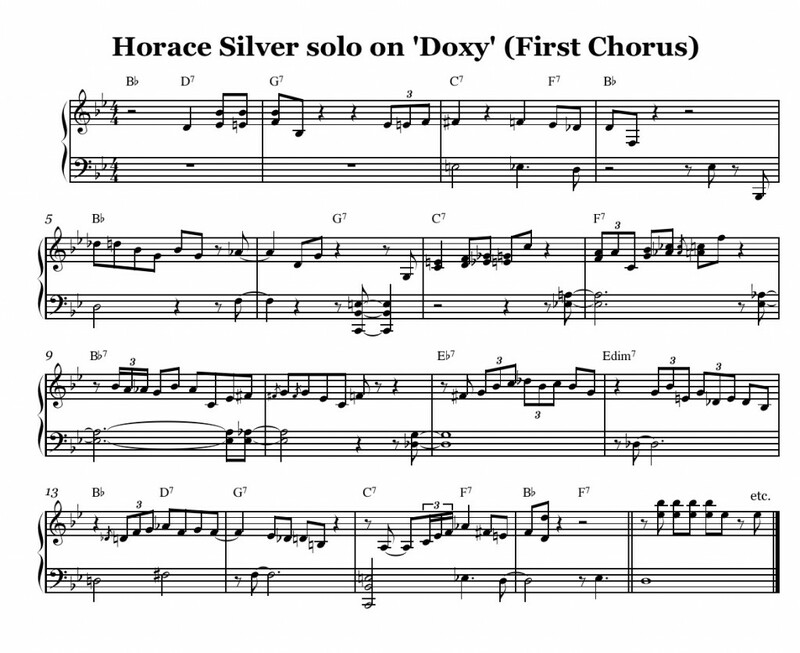 The progression from ‘When The Saints‘ is also a musical ancestor of the progressions found in Horace Silver’s ‘The Preacher’, Jerome Richardson’s ‘Groove Merchant‘ and Sonny Rollins‘ ‘Doxy’. (Dig the opening solo by a young Roland Hanna in the ‘Groove Merchant’ video!) In the version of ‘Doxy‘ from ‘Miles Davis and The Modern Jazz Giants’ (available on iTunes), Horace Silver’s piano solo demonstrates how pianists from the bebop era onward moved the role of the left hand away from the metronomic timekeeping heard in most of Purnell’s solo and made it an independent voice which could use chords as conversational responses to right hand melodic phrases. Where call and response is a primarily a method of melodic evolution in the Armstrong and Marsalis versions, Silver’s solo is like a tennis game between harmony and improvised melody in which the left hand lends a sense of tension to the chord progression by bringing many changes in a half beat earlier (and in m. 6, a beat and a half earlier) than they appear in the bass line. Saxophonist David Murray and drummer Steve McCall make great use of ‘Doxy’ in their accompaniment to the Amiri Baraka poem ‘The Last Revolutionary’ on the early eighties record ‘New Music, New Poetry’. (Baraka’s poem, which skewers leftist icons like Abbie Hoffman and David Dellinger, offers a counterpoint to conventional narratives of 1960s political activism, and is a prime example of Baraka’s poetic gifts.) The sarcasm with which Murray plays the tune in this version helped me connect it with a number of tunes that use very similar progressions and fall into a category that might be called the ‘gospel of the marketplace blues’. This was a prolific trend in pop songwriting of the 1920s and 30s: tunes that used the premise of either advertising a product or offering cautionary advice to the buyer. These include advertising tunes like Robert Johnson’s ‘They’re Red Hot‘ and its distant cousin, Arlo Guthrie’s ‘Alice Restaurant’ and cautionary tunes like Sippie Wallace’s ‘Women Be Wise’ and Fats Waller and Andy Razaf’s ‘Find Out What They Like And How They Like It’. Although the world-weary humor of Sippie Wallace and Fats Waller seems far removed from the reverence and sincerity of Paul Simon in ‘American Tune’ and Wynton Marsalis in his UVM rendition of ‘When The Saints’, all these tunes and performances demonstrate an important jazz truth: knowing and respecting a tune, and having some awareness of its origins, gives you the flexibility to interpret it in a way that tells a new story. To put it in different terms, if you know where the train you’re riding began and where it’s headed, you can relax and tell your story along the way. I thought the clapping was all over the place. It sounded like people were just clapping at will. Even so, Marsalis was smooth and dignified in his performance. He played his piece short and sweet, ending with a smile and a bow. I wish I could have graduated earlier to be able to see him play. A version of “When the Saints go Marching In” with Louis Armstrong and Danny Kaye. I’d be interested to know more of your thoughts on how different artists take the same song and, whether through changing style or lyrics, change the meaning to suit their needs. When does it work, when does it not? How much can you change while ostensibly playing the same song (I thought your choice of the word “neutered” in regards to the Beatles version may belie your opinion on that one), and could a cover have the same lyrics, same chord progression, but to have so changed the context to now be playing a different song entirely (The people over at Scott Bradlee’s Postmodern Jukebox come to mind)? Was Wynton Marsalis playing the same song at the graduation event as is played during Mardi Gras? This is getting a little pedantic and no worries if you don’t respond or have concise answers. Loved the post. Did not know Wynton Marsalis’ son graduated from UVM. That’s pretty cool! I only wish I was attending this school when he came to speak and perform. I always enjoy listening to him. Jon Stewart interviewed him back in 2007, it’s worth checking out. This was an interesting article! I especially liked the cover of “When the Saints” by Dr. John- his interpretation of this classic was spectacular! I didn’t know that it was used in New Orleans during funeral marches. I also thoroughly enjoyed this line: “in order to overlap meaningfully with one’s duet partner, one must first know how to stay out of their way.” I was wondering what makes this tune in particular so timeless though? Is it its simplicity alone, or the era at which it was written? Thanks for the clarification, Lars. I guess that shows how labeling on iTunes (where I found the ‘Streets of the City’ solo) can get mixed up, when it’s there at all. I’ll certainly check out Robichaux some more. There is no shortage of lesser-known piano players who made great contributions to the music, and I am always glad to find another one! Interesting views here. But the pianosolo here said to be played by Alton Purnell is in fact played by Joe Robichaux on the record Verve Records ‎– MG V-8325 recorded in 1959! Purnell had a different style from this and he left George Lewis band in -57. Nothing wrong with clapping on the 1 and 3! Especially at the start of a groove like that, with the bass drum emphasizing the downbeats and the cymbal barely hinting at the back beat. Jack showed me the video of Marsalis’ and Ray’s performance, and pointed out that someone on the podium started the crowd clapping on 1 and 3. Oops!